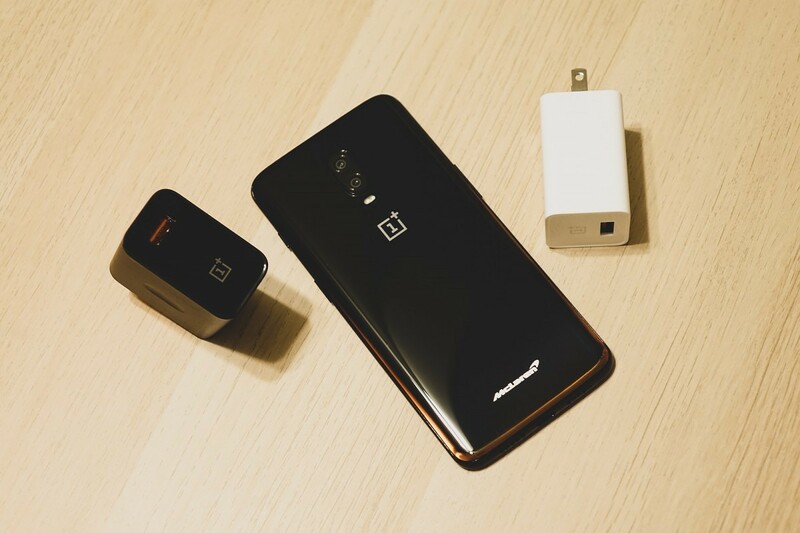 When OnePlus announced the OnePlus 3 in 2016, they also announced their exclusive charging technology, then branded “Dash Charge.” The OnePlus 6T McLaren Edition marks the first departure from that tried-and-true charging platform with the newly branded “Warp Charge 30” charger that pumps up to 30W of juice into the device, a jump of 10W over the older system. 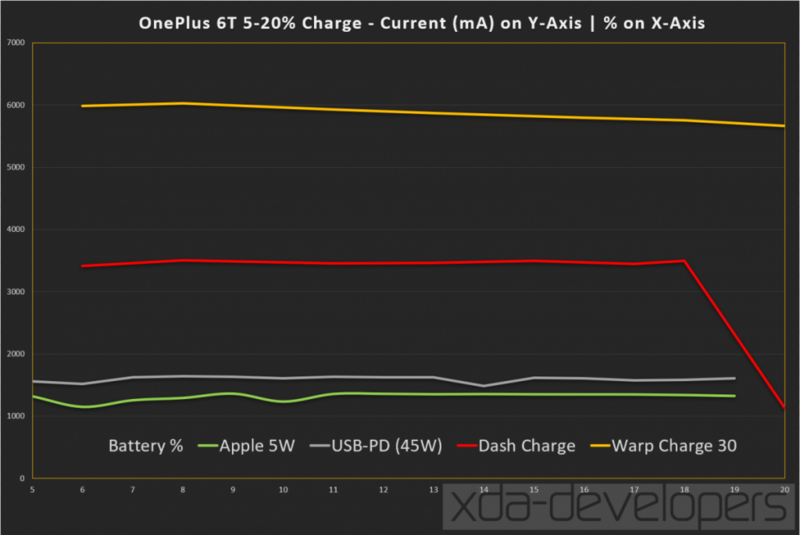 Today we will dive deep into the differences that you, as a user, will notice with this new charging solution, as we fully expect it to be OnePlus’ defacto charging technology come next year with the OnePlus 7. So what have we found related to this in the new Warp Charge 30 on the OnePlus 6T McLaren Edition? Well, not a lot. 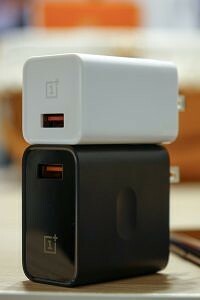 OnePlus is still pushing this “exclusive” (read, proprietary) standard with this new larger charger. The Warp Charge 30 block is rated for 5V @ 2A (10W) or 5V @ 6A (30W) if you are using the proper cable and a compatible device (so far, only the OnePlus 6T McLaren Edition). 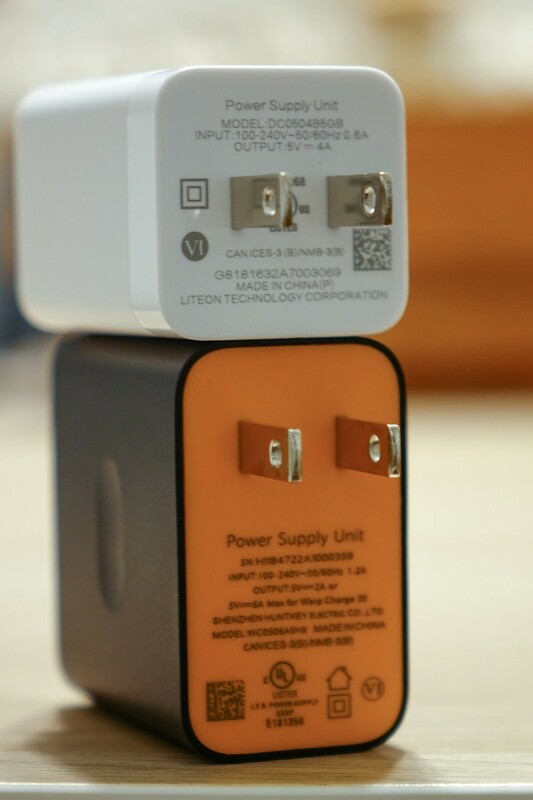 This is different from the older charger which is rated for 5V @ 4A (20W). The max input for the charger is also doubled at 1.2A compared to .6A for the older Dash Charge block. The question I think many of us are asking now is do older OnePlus devices benefit from this new charger? The short answer is no. The long answer is a little more complicated, as my testing did show a difference, but it was not a very large one, especially compared to what the Warp Charge 30 is actually capable of. So, let’s get to the graphs and numbers, shall we? That said, Warp Charge 30 is blisteringly fast. While testing this I had plugged the OnePlus 6T into the wall to update Fortnite and in the 3 minutes I had it plugged in, the McLaren Edition OnePlus 6T went from 3% to 12% battery. In our testing here, Warp Charge 30 brought our McLaren Edition 6T from 7% to 22% battery in 6 minutes. Temperatures, though, do seem to take a hit from the faster charging solution. 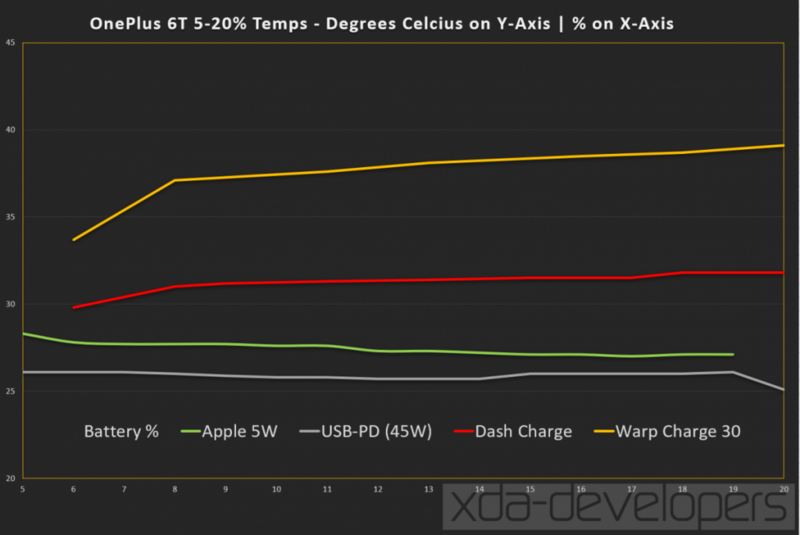 Dash Charge was about 20% cooler during this test with a maximum delta of almost 8 degrees Celsius, showing that all of this extra power does take its impact on the battery heat output and ultimately the battery longevity. There was a 33% positive bump in charging time though, so it really depends on what your needs are. Otherwise, Dash and Warp Charge 30 seem to perform relatively similarly in this test, with both the charging current and charging voltage showing significant bumps over their non-OnePlus certified companions and following similar curves. 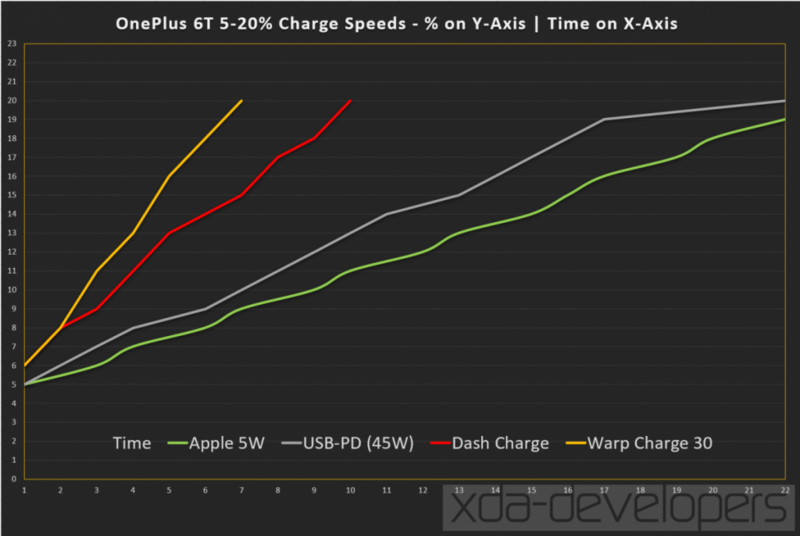 Relatively speaking though, Dash Charge and Warp Charge 30 are the only way to fast charge a OnePlus device, and thankfully the older Dash Charge is forwards-compatible with devices capable of this new charging standard, so if you are upgrading from a OnePlus 3 or newer you can keep your old charger or the expensive car charger as a spare, or maybe one for work. Just like the older charging solution though, you should not depend on USB-PD or Qualcomm Quick Charge chargers to do anything for you other than the bare minimum. USB-PD took 20 minutes to go from 5% to 20%, something Warp Charge 30 did in 6. One of the tests I really wanted to do was seeing how the charging was affected while gaming on the OnePlus 6T McLaren Edition, and what benefits if any it offers over Dash Charge. One of the massive upsides to OnePlus’s charging solution is that it allows the phone to be charging without adding any major additional heat to the device. Some devices have been known in the past to actually turn off Fast Charging support while the display is on, and some resort to a trickle charge, not to mention gaming. Well, I have good news. Warp Charge 30 is our new gaming champ without a doubt. So here is how I benchmarked this. I drained the device to 5% battery, waited until it cooled down and the plugged it in once I was already loaded into a match of Fortnite. Now to keep this fairly consistent I did not enter a normal match, nor did I actually “play” the game. I loaded into Playgrounds, went to an area with water and just left the device there. Fortunately, Fortnite does not kick users for being AFK which is odd, but it worked to my advantage here. 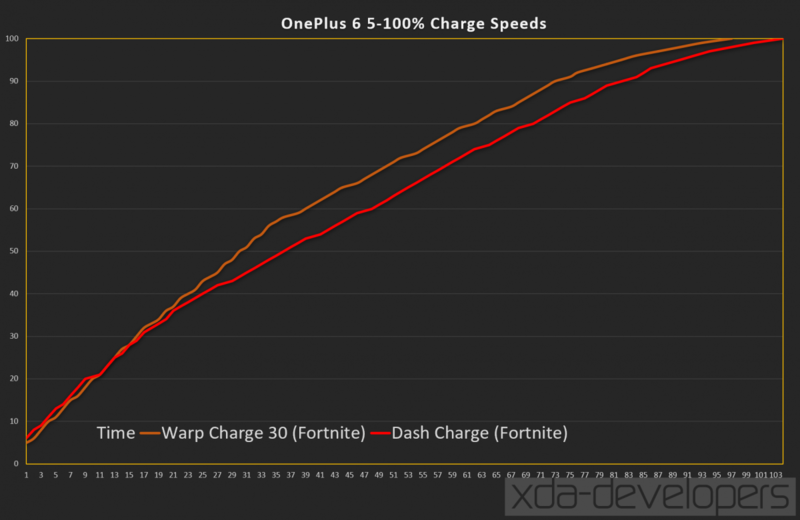 I performed a baseline for both Dash Charge as well as Warp Charge 30 to see how differently the OnePlus 6T McLaren Edition performed. So here is how the McLaren Edition OnePlus 6T reacts under load and this is where things get a little interesting. Warp Charge 30 is significantly faster than Dash Charge while gaming, and behaves differently too. Our 5%-100% benchmark took only 60 minutes – a mere 6 minutes longer than our baseline no load test – and crushed the Dash Charge which took a, by comparison, long 81 minutes to fully charge without load, and 101 minutes under load. Peering deeper into the data we see some significant things. The first is that Warp Charge 30 loves to cram power in quickly, but it is cautious of the overall battery temperature. Right at about 19% battery we see Warp Charge 30 drastically drop the current coming into the device and at this same time the battery hit 44 degrees Celsius. It did not get back to over 3,000 mA of Current for a bit when the battery temp was back in check. Looking at our baseline non-load numbers, you can see where the tiers of charging power are in Warp Charge 30. It is not until the battery is at 25% charge that we see a significant drop in current into the device of about 500mA and then again at 35% we see it drop another 1,000mA. From there it drops slowly but steadily until it hits its final drop around 80% charge. This is in contrast to the curve the Dash Charger had. 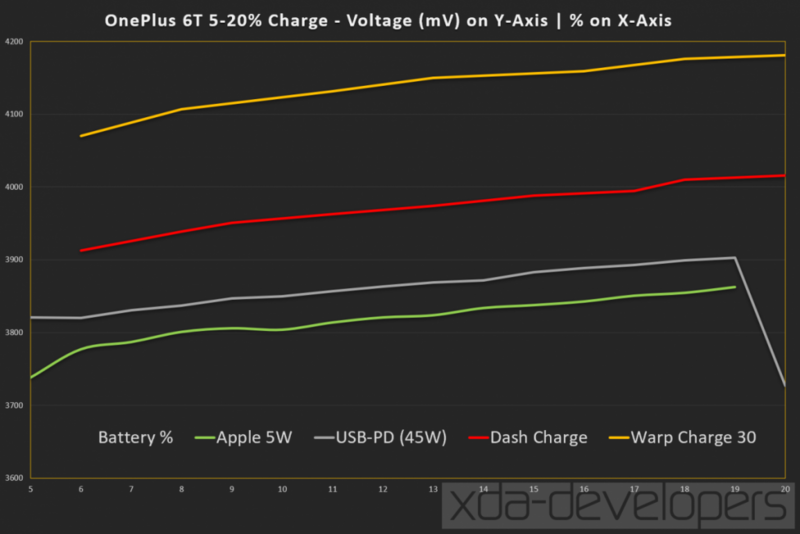 The Dash Charger will stay fairly constant until it hits 70% charge, where it will throttle back the current by about half and is why their graph curves fall off right around that range. In terms of temps, we don’t really see a huge difference between Dash and Warp Charge 30 here, but there is higher across the board in most cases. The largest gap is around 10% battery where the Warp Charge 30 has the battery about 5 degrees warmer. That is until it has that drop in current we just spoke about and from there they run similarly with Warp Charge 30 actually staying cooler than Dash Charge under load until we hit 70% battery. Around 75% battery, the Dash Charge falls flat dropping from 2,300 mA down to 1,000 mA and sometimes lower. This behavior is also present on the OnePlus 6 with the Dash Charge, so it is likely by design and not something at fault which is likely the wise move to preserve battery longevity. So is Warp Charge 30 on the new OnePlus 6T McLaren Edition any good? Warp Charge 30 is excellent, especially if you love to game while charging. Just like Dash Charge, you will have a device that runs cooler than most others while charging, and gain battery like a beast even while pushing the device with one of the more demanding and popular titles. That is not to say everything is rosy. It is a shame that at $699 we are still having to deal with USB 2.0 and zero support for any other fast charging solutions on the market, forcing you to deal with abysmally slow charging without buying accessories from OnePlus or trying your hand at a VOOC charger. Temperatures are also becoming more of an issue here as well. While I still need to look to having a proper comparison with other devices on the market, Warp Charge 30 still runs cool while under load and charging but it is a not-so-insignificant bump of around 20% warmer in our 5%-20% charging test versus Dash Charge. While gaming though, the device is only 14% warmer than our baseline results which is a really solid result considering much of that heat likely comes from the SoC. I’d say conservatively you will find a 10%-15% bump in battery temps using Warp Charge 30. The standout number for me is that while gaming, Warp Charge 30 is only 6 minutes slower to 100% and will still get you a full top off in right at an hour. All of that being said, I think OnePlus needs to create special options in the software so the user can decide if they want the full power, or just a normal slow charge overnight. While this charger does not seem to generate the level of heat we see from other charging solutions, Warp Charge 30 in a no-load scenario still runs warmer than Dash Charge under load. More user facing options are always welcomed. If you have a OnePlus 3 or newer, you should not go out and buy a newer charger when they become available as it seems older devices are not yet currently capable of supporting Warp Charge 30 as the above images show. While the Warp Charge 30 charger did show a small improvement in small areas, those gains were not substantial and could be due to a host of other things. We just do not see the same change in the charging curve that we see on the OnePlus 6T McLaren Edition. OnePlus brands Warp Charge 30 as being capable of getting you 50% charge in 20 minutes, and although our testing was just shy of that here – we only got 48% – I feel they can stand by their words here. 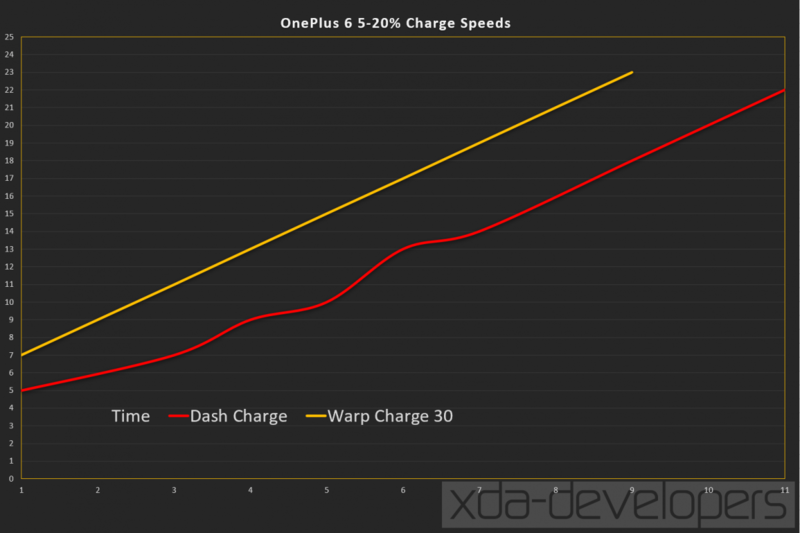 Warp Charge 30 is fast and the natural successor to Dash Charge and although it is currently locked just to the McLaren Edition OnePlus 6T, I absolutely believe we will see this as the OnePlus standard charger going forward.